What is bridge? Bridges are a great option when you want to replace a missing tooth. A typical bridge is putting a crown on the tooth in front of the missing tooth as well as on the tooth behind. The Dentist would prepare both teeth for crowns and take an impression. The impression gets sent off to the lab. The lab then fabricates crowns and well a fake tooth in the middle. The bridge is one piece and is permanently cemented in your mouth. 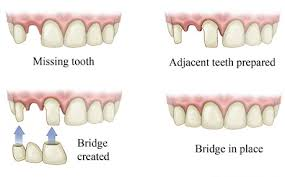 A bridge can look completely natural and can involve more than one missing tooth. If you have any questions on what a bridge is or if this would be a good option for you, Please give Power Ranch Dental a call! We specialize in these procedures and have excellent patient care!